I love these crispy little babies for breakfast, as a side dish, or even as a snack. Yeah, pretty much any time. Some people like to serve them with applesauce but I prefer the good old fashioned dollop of sour cream. A great trick- especially if you have a finicky kid- is to add some carrot or even broccoli stems to the mix. Basically any firm vegetable will work and they’ll never even know the difference! Peel and then grate the potatoes and rinse very well. Roll up grated potato in a clean dish towel- jelly roll style- and squeeze out as much moisture as you can. Place in a bowl add lightly beaten egg and salt and pepper and mix well and then sprinkle with flour and mix again. Heat oil in a large pan and drop batter to flatten and form small pancakes in small batches. 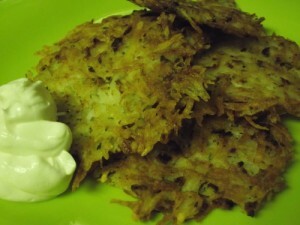 Cook until golden brown and then flip and repeat (about 4 minutes first side, 2-3 minutes second side) Transfer to paper towel to remove excess oil, top with sour cream, and serve crispy and piping hot. **I also like to add in a good sprinkle of dried chilies for a little kick or sometimes some fresh parsley and Parmesan cheese. Basically, the options are endless!